Paragon Hard Disk Manager Premium is Make full use of your hard disk capacity! 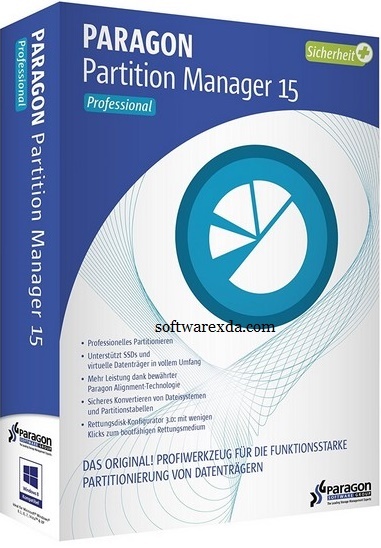 The Partition Manager offers an extensive range of functions for flexible partitioning, optimization and managing your computer. No matter whether you are restructuring your hard drive and dividing it up in partitions, redistributing free memory storage space, using several operating systems on the PC at once or want to work with virtual hard disks, Partition Manager puts a single first-class partitioning tool with powerful extra functions at your fingertips. New! User interface color scheme, intuitive controls, and comprehensive UX improvements. Perform a surface test to identify bad sectors. New! Disk Cloning for easy system migration — Create an exact, uncompressed replica of a system hard drive on another drive, saving migration time and effort with greater OS portability. Backup & Recovery delivers smart, automated backup strategies and system recovery management. Partition Manager provides hard disk storage organization and optimization. Whenever internal drives run low on disk space due to multiple partitions accommodating different systems and data types, this feature resizes partitions to maximize available storage capacity. Drive Copy assists with migration of an entire hard drive or operating system to a larger-capacity HDD or a speedy SSD. The user can continue working uninterrupted while live migration of the system is performed, and only switch over once migration is completed. Disk Wiper is a professional data erasure tool that ensures safe HDD and SSD recycling and information security. Home users can permanently wipe sensitive data before transferring a computer to a third party, thus protecting their privacy and eliminating the risk of personal data misuse. Disk Wiper employs more than 10 algorithms adopted by military and government organizations worldwide.